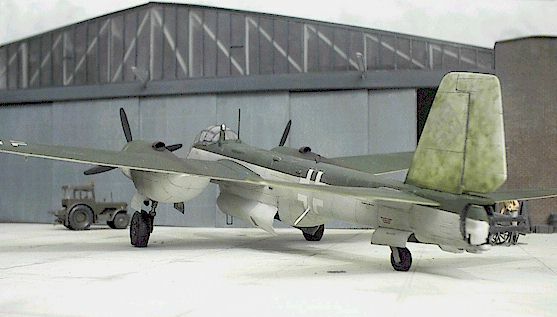 In this second article about building dioramas we will turn to a more complex theme - building a hangar to act as a background for your models. 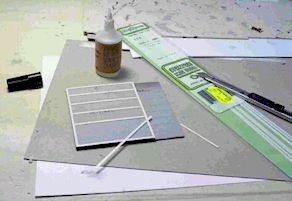 You cannot buy anything like this on the commercial market even in 1/72 scale, but you can find the materials you need. In my earlier article we explored the issue of the depth of an image. 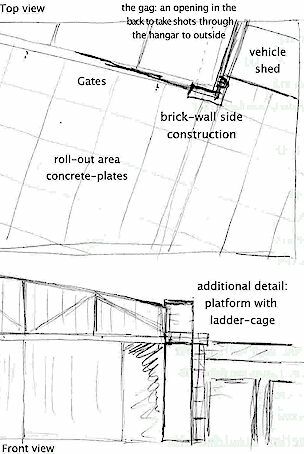 This theme comes up again if you want to depict the hangar with partially open gates (maybe moveable). Is there a way to disguise the fact that your hangar is only about 10 cm deep, instead of 30 meters? If our back wall is inside this cone, we can simulate the effect by colouring the back wall in black, and lighting the vertical area like the horizontal cone would. But this representation does not work if there is full light through the opened gate, flash light or low-angle of light from the evening or morning sun. Under normal circumstances you will not recognize anything inside the hangar because of the great light/dark-difference (see result photo). Your hangar design can be purely imaginary, but for maximum realism it is helpful to use reference photos. 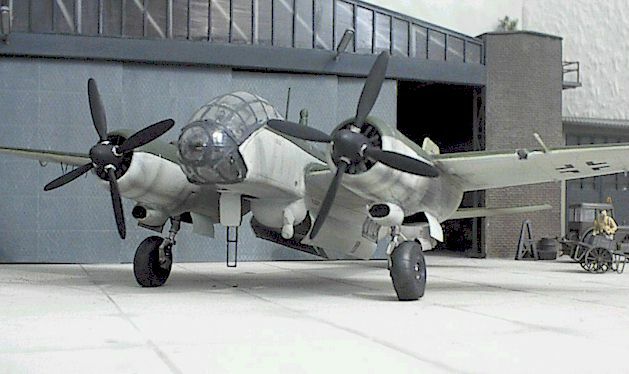 There are several styles of German hangars. These range from small buildings on combat airfields for the maintenance, or huge structures for production or evaluation purposes. One interesting point about these photos is the construction of the doors. In the second photo, each segment pivots and slides, and appears to be divided into four sections. Different designed doors, hung on separate rails and subdivided into 8 elements, can be seen in the first photo. Above the doors in both designs there is glazing with narrow windows. I chose this style of the second depicted hangar. Here is the original sketch I made after reviewing my reference pictures. You can design the scene with "clear" lines in squares or rectangles according to the ground plate. To get more realism into the design, I planned to apply the buildings in a sharp angle to the ground plate in order to increase the illusion of perspective. As an additional benefit, the frontline falls back and you get more space to display the models. I had the idea to open the back wall to take snapshots from inside the hangar to aircraft located outside. 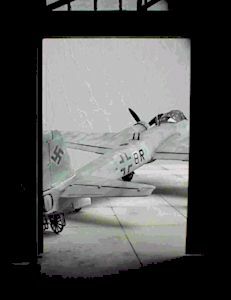 There are some nice original shots with such a view from the Focke-Wulf specimen factory at Delmenhorst-Adelheide (Fw190d11/ Ta152; Jet+Prop 5/97). If you want to have more "life" in your design, you may add some details, like a platform. Roco (Austria) offers a fine vehicle shed in 1/87. It's dimensions also fits for 1/72. I had saved models of large electric devices for years: drillers, slicers and so on, they will be used for the equipment inside the hangar. The first job is to apply putty to the ground plate. I used a cheap oil-putty for the basic coat, applied in a layer of 0,5 - 1,00 mm. I scattered some real cement on the wet putty, but that was of no use and I sanded it down later. I had better luck with portraying details. I pressed the structured back of a nail-head into the wet putty to get sewage-covers. The next step was sanding. I used my Bosch-Delta-Sander because I hate manual sanding. There was a lot of work left - filling many scratches and fine-sanding (this time manual). After sanding you can see the fine structure of the sewage-covers. Now it's time to assemble the back and the main walls. I started on the inner coat of 2.5 mm cardboard, then the brick-walls. This photo shows the temporary supports to hold the walls during construction. I used only cardboard & hot glue for these walls. I also engraved the joins between the concrete plates with the back of my X-Acto-Knife at this stage. The 3-D result is much better than painting. The next step was to mount the main support that suspends the gates. Now the scratch-build theatre begins! At first we need to assemble the vertical supports - you need to calculate the correct inclination. The best way to glue this styrene is cyanoacrylate (gap filling type). The parts hold even better if you sand them before gluing. ...while in this picture you can see the fading light cone, visible if the first gate segment is open. The next job was the windows. I wanted to get a milky weathered effect. The best way to do that was sanding the clear sheet with fine sandpaper (600). To avoid painting problems, I painted the 1x1 mm window frames before gluing them to the clear sheets with Humbrol Clear-fix. There is another detail to build - a fine grid-tower is located direct behind the front wall as a main support. It was taken from the Brawa signal-bridge. Before applying the windows the diagonal supports (angle-profile) were fitted and sprayed in light grey. For the main roof you need more than one plate. They were glued with super-glue, the joint was filled and sanded. I applied a copper angle to the edge. Now it was time for the main paint job: Painting and weathering the brick-walls and the roof, also the concrete. It was more difficult than I expected to get a realistic result. Sometimes it was too dark, sometimes too light. It took about 5 layers to get the result I wanted. The last layer was thinned white to lighten up the centre of the plates. After this, I applied a wash to the join-lines between the concrete plates. I brushed water on areas of 20 x 20 cm, waited a little while and then applied thinned black colour at the crossings. The colour ran along the line itself by the "capillary-effect" and faded out. Sometimes there was more colour left, sometimes less. The sewage covers were painted with Humbrol Metal-Cote and softly polished with cotton-sticks. One of the last big jobs was to build the doors. The door elements were designed for dimensions of about 5 m width and 8 m height. I think that the original was a little smaller. 4 of 6 doors were built in a fixed construction, the last two as one movable element. I applied a skin of corrugated foil after gluing the frames. Some lines had to be scribed. I sprayed the finished doors with a medium blue, and toned it down with thin layers of grey. Weathering was achieved with heavily thinned dark brown, sprayed in a very low angle to highlight the structure. The vehicle shed had to be modified because of the sharp angle of the design. I had several problems with the Roco-styrene. Usual styrene cement did not work, even super glue took a long time to stick. But the kit itself was fine, especially the movable gates and windows. Building the platform was the next challenge. I had planned to build this platform on the sidewall and front, but it was "overdetailed" to me, so I left it at the side. Pure scratch-build! It was difficult to apply the fine handrails, but it finally worked. The last task was to build a workshop inside the shed along the brick-wall. I installed an inner platform (usually not visible) with lights from model-railroad (9 to 12 volts). This was so difficult, that I decided to build the installation separate on a base of clear sheet styrene. My spares box came in very handy for this part of the project. I used parts that I had been collecting for years! Some 1/72 scale bases had to be elevated for a more realistic appearance. Metal parts were painted with Metal-Cote. After polishing you get very realistic results. I added some fine tools from Preiser. This photographed assembly (above) is about 2 cm high and 10 cm long. I was glad to use my new digital camera this time. This high-resolution camera from Hewlett-Packard delivers well-detailed and clear results. Finally, I opened a hole in the back with a hole cutter and installed a lid to open the hole as required. 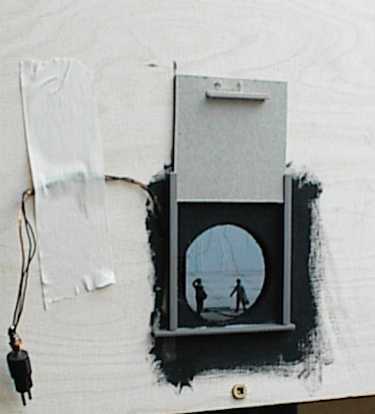 The lid is covered by dark grey paper on the inner side. On the shot you can also see the electric installation. 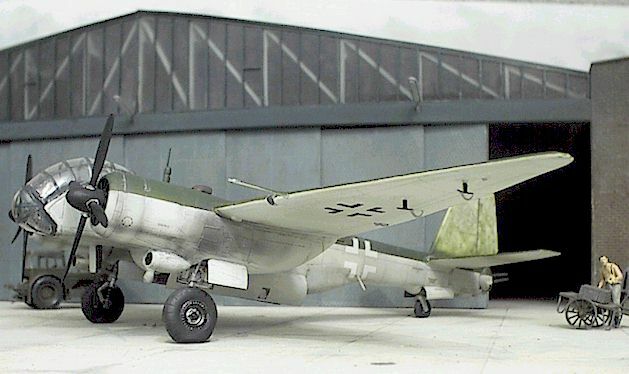 This is a Junkers 388L reconnaissance aircraft. It is the Kora resin kit. You can see some tools right from the opened gate. I will use them for elevators ("Aufbocken"). There are many photos showing maintenance using those elevators. At first, I decided to scratch-build them, but I had the chance to find something that would fit. 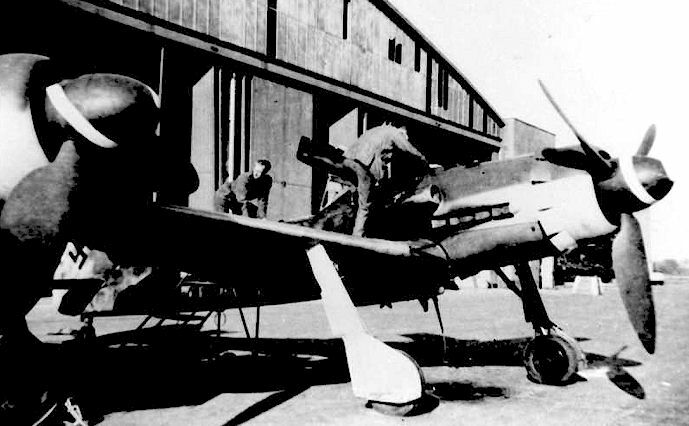 Building a hangar is a more challenging project than simply putting trees on a piece of wood. You will have to do much more detailed planning and calculation, otherwise you will have problems. Your abilities as a modeller will be stretched, and good tools will be essential (mini razor saw for example). This is not a project for a beginning modeller. But if everything works, you will get an impressive scene in which to present your models. Pricing is much cheaper than the airfield project. All together, I spent about 100 DM (40 US$). Try it! This example can adapted to typical hangars all over the world, historic or modern. It will be possible to get the necessary material, and with a little luck you may even get useful kits for secondary buildings, equipment or vehicles. In any case you will have something unique - not a kit that everybody has. My last hint is not to plan your diorama too small. You may put a lot of work in only to discover that you can't get an acceptable shot of your model. I hope you have enjoyed this second article about building dioramas. Maybe there will be a third one about modifying vehicles and figures later. Any comments are welcome.